Cheese slicers are a unique and easy way to cut hard cheeses instead on using a tradition sharp knife. When you know how to use them properly, they make easy work of cutting a block of cheese and providing you keep your fingers out of the way of the wire that can cut you; they are safer than using a knife. Cheese slicers are made from a variety of materials, from marble bases with wire, to models that have a handle attached to a wire. Whichever kind you prefer, you will love the ease in which you can slice blocks of Cheddar, Colby, Swiss and more. Cleaning the cheese slicer after each use is very important due to the bacteria that can form on the wire itself. Carefully take a washcloth and clean off the wire and edges and the base as well to rid it of any leftover cheese that can cause trouble later on. When using a slicer to cut cheese, be sure to place it on a stable surface to avoid accidents and injuries. If using a handheld slicer, make sure the block of cheese is on a flat surface for the same reason. The slicers below are great for slicing all kinds of cheese and any would be a great addition to your kitchen. This cheese slicer will make quick and easy work of any cheese cutting jobs you have. The white marble base keeps cheese cool while you’re cutting it and is sturdy and heavy too. Durable stainless steel cutting wires work well on soft cheese and hard cheese. The 8” x 5” base has protective, non-slip rubber feet to keep it sturdy and in one place while you’re working on the blocks of cheese. Includes an extra replacement wire for when the first one needs to be changed out. Attractive and well designed, this RSVP White Marble Cheese Slicer looks great in any kitchen and makes the perfect gift for any cheese lover. This cheese slicer is very easy to use and can cut different widths of cheese easily and smoothly. With proper care and cleaning, this cheese slicer will last a long time. Hand washes easily with soap and water. 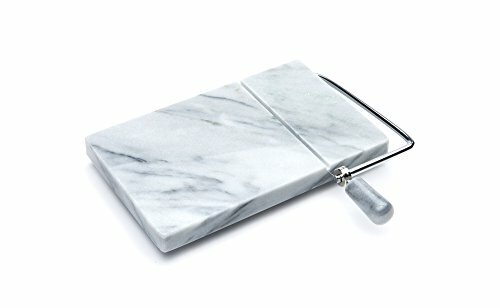 This marble cheese slicer is not only functional it’s beautiful too and fits in with any kitchen décor. You can cut any kind of cheeses with this slicer, both hard and soft. Included are two replacement wires. The non-skid base measures 8” x 5” and has rubber feet on it. 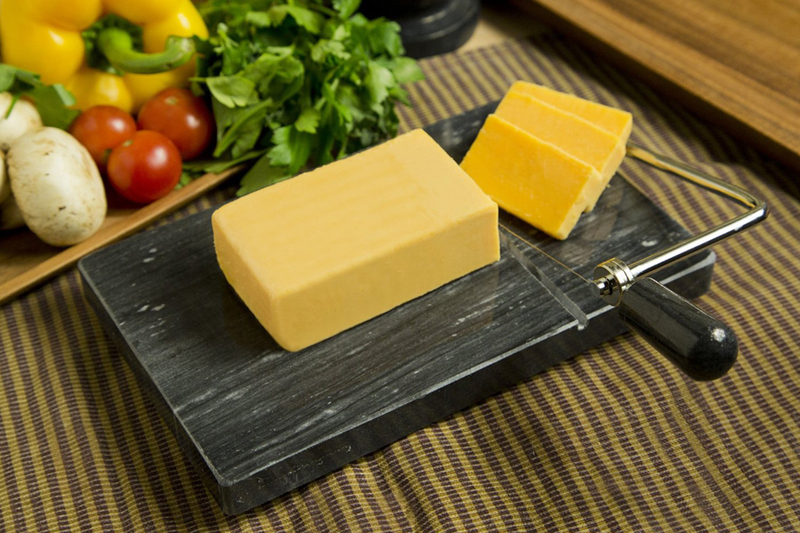 The marble base is not only great to look at; it serves the purpose of keeping the cheese cold while you are cutting it. Wires are made from long lasting stainless steel. 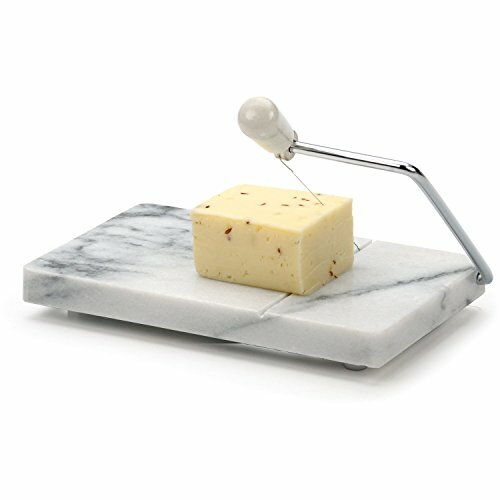 Heavy and durable, this marble cheese slicer would make a great gift for a newlywed couple or anyone who loves to entertain. This slicer from Fox Run hand washes easily with soap and water. This heavy duty, hand held cheese slicer can make simple work of cutting blocks of cheese. It is made of zinc alloy and with regular use and proper cleaning it can last a long time. You can easily cut different size widths of cheese with this cutter just adjust the cutting size with the little knobs on each side. This Norpro Adjustable Cheese Slicer uses a stainless steel wire and includes an extra one with your purchase. Super easy to store, just keep it in a drawer in your kitchen and you’ll be ready for any cheese cutting job. It is recommended to hand wash this slicer to preserve the condition of the cutting wire.